Shepsed, or Sheepshed as it once known, isn’t the biggest of towns in the country, in fact not long ago it wasn’t a town at all, it was a village. With just 14,000 people living here, it’s fair to say that there’s much bigger out there. But you can’t say the same thing about Spitting Pig, because we’re a big fish by any measure when talking event catering. We’re a hog roast and spit roast company, there’s been hog roasting in town since well before we were known as the hotspot for wool trading, and while the wool market might have declined, hog roasting certainly hasn’t. 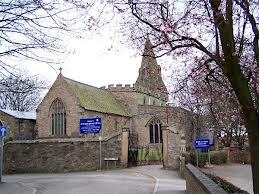 Without doubt this is a great place for us to be, there’s no better town pound for pound than Shepsed, there’s many available venues – the numerous public houses Shepsed is known for, for a start – that are great places to hold an event, especially with a hog roast. The mix of amazing venues only scratch the surface of what makes hog roasting so great to be doing here, the other local trademark that we thrive in is that the place is in no short supply of farmers, particularly it’s an unbeatable source when it comes to free range lamb, the pigs we get from the region are also top class. We’ve been here for long enough to know what the locals like, and certainly we’ve been hog roasting for enough time to know the ins and out of catering, which services and menus are conductive to maximum entertainment at which event. 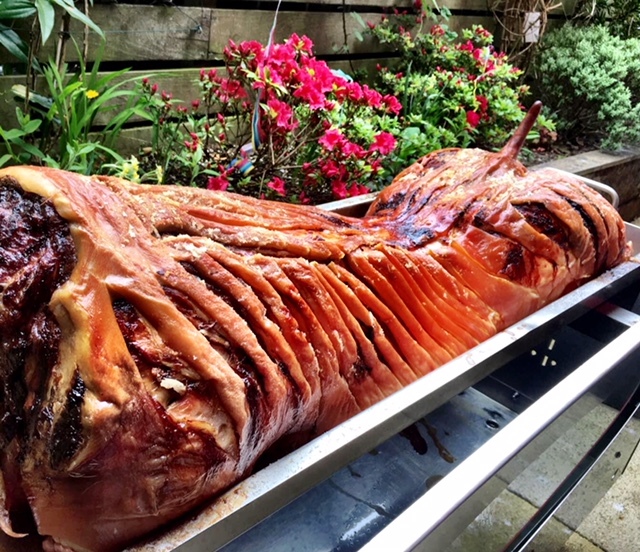 Our hog roast Shepshed clients know that too, they’ve witnessed for themselves out adaptability, our knack for doing the small things just right and ensuring in the process that the hog roast is as meaty as ever, just how your guests like it. So what, exactly, does hog roasting entail? Despite the top of the line expensive equipment we use – and the scrupulousness of our hog chefs – it’s very easy to do. Actually, even you could do it, and we’re not just saying that, you can make your own with hog roast hire Shepshed. To begin the process what you need to do is, first and foremost, find some meat. Which meat you use doesn’t matter, but for sake of argument lets say we’re cooking a pig… So we take a pig, we then score and salt the pig, an important step if you like your crackling to have extra crunch. Then you place the pig on the spit roasting machine, make sure it’s secure and after that you can turn on the machine and relax. The machine takes care of the next few hours as the spit turns in automated fashion via the machine, the reason for the rotating is fairly obvious, it helps the pig cook evenly and also saves and encourages really rich pork juices to remain in the pig – that’s where the hog roasts get their extra flavour from, very little of the pigs natural juices are lost. Our chefs are constantly checking on the pig, that’s what they’re paid to do after all. 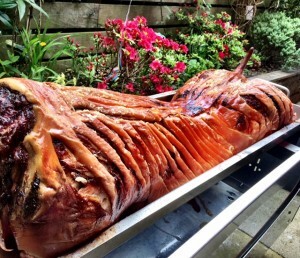 But for you, if you think hog roast hire Shepshed is something you’ll enjoy, the pig really only needs looking at every 30 minutes or so, just to gauge whether it’s cooking too fast or too slow. Being the catering experts that we are as our Shepshed clients will attest to, we go a distance further than just spit roasting pigs and other whole meats. Spitting Pig chefs are genuinely talented chefs even if you take away their hog roast machines. Their expertise also encompasses the creation of canapes, starters and much more. 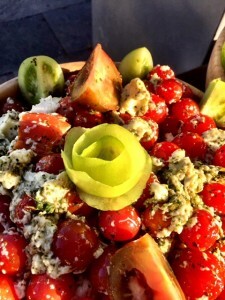 They need to be good at doing this because a fair number of our catering packages have non-hog roast dishes, one example are the salads and potato dishes which you can have with your spit snack. Caesar salads, couscous salad, new potatos, jacket potatos, spicy wedges, there is a lot our chefs have to be good at and good at it they are. Guests regularly delight when they realise we’re as good with salads, desserts, starters and the like as we are with roasting pigs. The hog roast Shepshed service the food comes with also gets people going. There’s 3 different serving options, there’s buffet menus, there’s specialised seating menus in which waiters will serve to your tables in stellar fashion, and there’s the classic spit snack and hog in a roll serving style, if you choose one of those great menus your guests will be able to visit a serving table just in front of the hog roast machine to collect their own piping hot hog rolls.